Set in the nuclear 1950s, Zombie Prom is the story of a forbidden romance between two high school seniors at Enrico Fermi High. Toffee, a good, sensible girl falls in love with a young rebel named Jonny (without an H). However, when Toffee is forced apart from her newfound love, Jonny attempts to take his own life by throwing himself into a nuclear power plant. Though this act does not kill him, instead, Jonny returns as an atomic zombie, more determined than ever to graduate from school, reclaim Toffee’s heart and take her to prom. However, in order to do this, Jonny will have to overcome Enrico Fermi High’s tyrannical headmistress, Miss Strict. 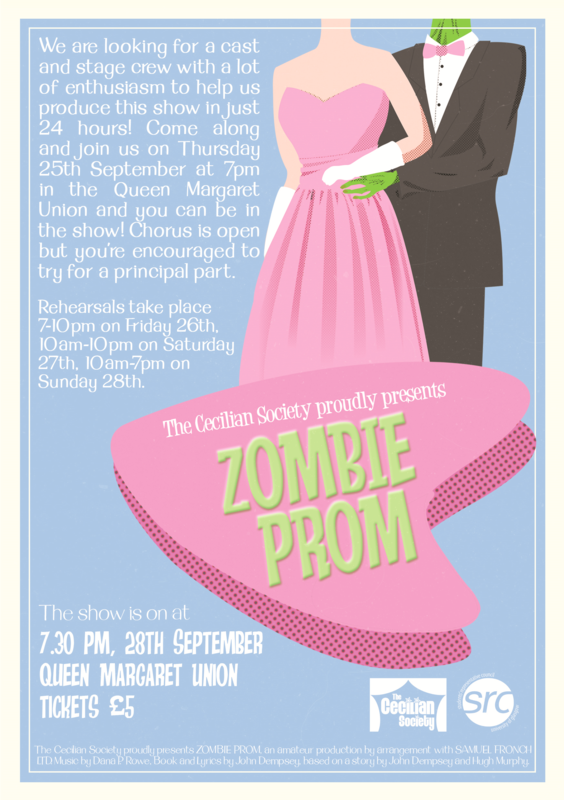 With its unique blend of genres, fusing a teenage drama with a science fiction B-Movie, Zombie Prom will certainly be an interesting Cecilian show, unlike any other. Its score of original songs sound like they come right out of the ’50s, so it’s sure to be an entertaining weekend show for all involved!